Many of your are already decorating for Valentine’s Day but I’m still embracing winter in my neck of the woods. Around here winter lasts for a while and often includes some snow up until March, so I thought I’d put together a Winter White Porch to last me until spring time. I just couldn’t stand having a bare porch until then! 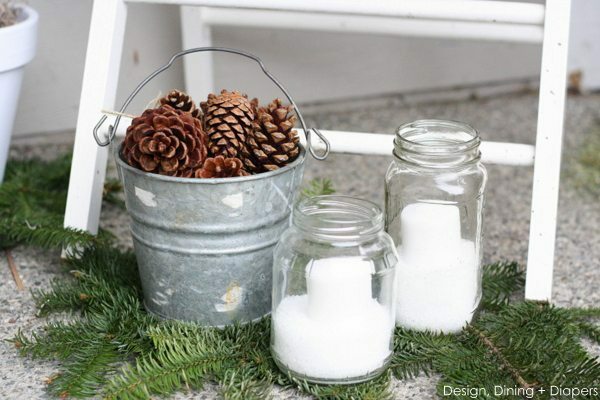 I wanted to put together a rustic winter white space that was welcoming and true to my style. 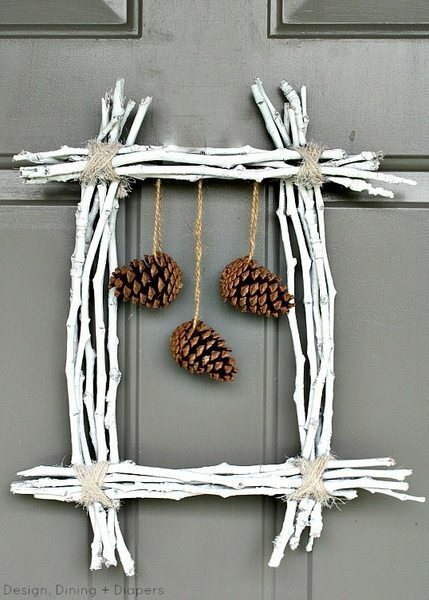 To create the look I mixed crisp white with natural elements including burlap, pine cones, branches and greenery. I mainly used things I had around the house and added a few simple DIY projects. 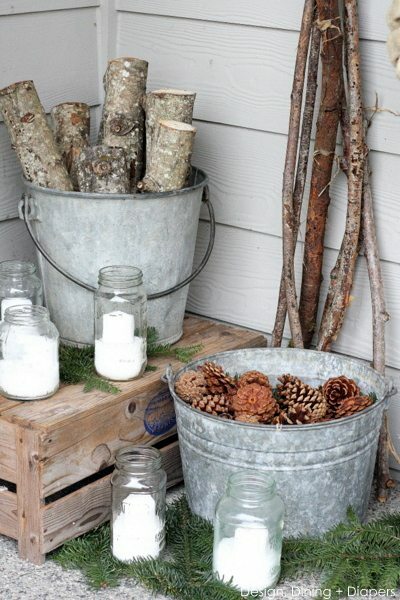 To the left is a display of galvanized buckets I got from my grandma filled with pine cones and logs. The branch display was made with fallen branches from the woods behind our neighborhood, wrapped in jute. And the stars are basic metal stars spray painted white. These burlap topiary trees were my latest DIY project and I’m so excited about how they turned out. They are a little out of my comfort zone but I like to stretch myself and I’m glad I did (tutorial coming soon). And the best of all they will transition perfectly into spring. I shared my Pine Cone Wreath with you all last week, if you’ve been around a while you’ll notice that this wreath has made an appearance through the last few months. You can see the fall version here and the Christmas version here. And off to the right is a cozy sitting area filled with my Hand Painted Burlap Pillow and Two-Tone Welcome Sign. So what about you? Do you keep a winter porch up until spring or do you deck it out for Valentine’s Day? Gorgeous as always Taryn! 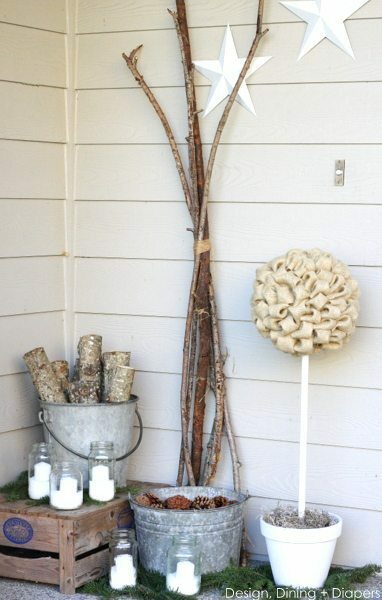 I love the white & tan color scheme and the rustic feel you brought to the space with the logs & pinecones! So cute!! I love it! So simple and elegant! I am thinking I should get to work dressing up my home’s front porch! I love that your home is painted gray and light taupe. It’s so nice that it blends seamlessly with your interior. Mine is brown and theres not much I can do about it due to HOA rules so it’s something I’ll have to adapt to. :-( Your porch set up is beautiful! I bet your neighbors are so happy to have you pretty up the block every season!! Wow! Your porch looks lovely! 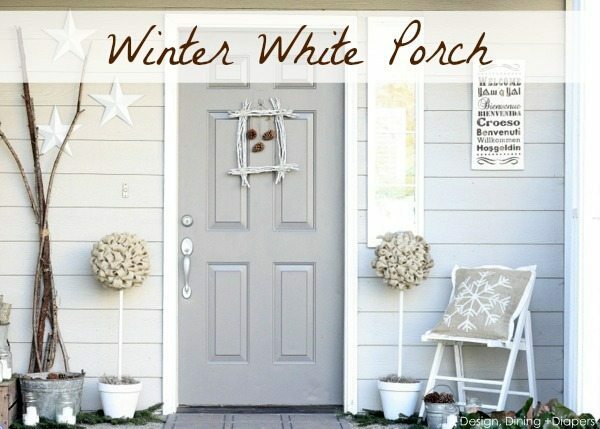 Unfortunately I live in a part of the country where my porch is naturally winter white—covered in snow! Ha ha. Thanks for sharing! My fingers are doing the walking tonight but now where I want them to go. Lost my comments. Love your front porch, it’s so pretty and yet not cluttered. It’s gorgeous. You have a definite knack for everything you do gal. Sure do enjoy your blog. 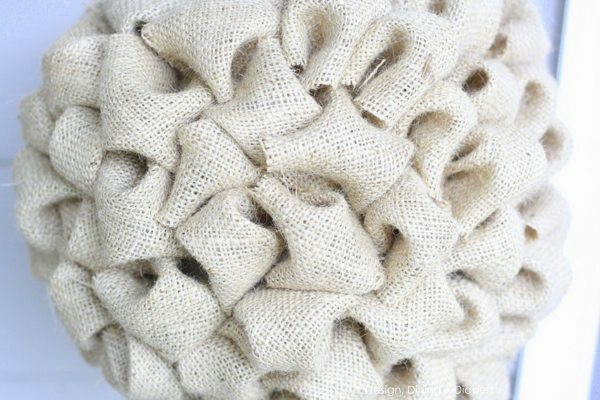 I’m looking forward to tutorial for burlap topiaries. They look complicated but hope they’re not. Love the color scheme you have going. We have plenty of snow this year along with very cold for weeks now. Can’t put things our on our porch or back deck as a certain furry kid loves to play with my decorations, and that’s besides what the weather does. He is such a dear boy tho, it’s hard to scold him. It’s a challenge to figure out ways to decorate without him getting them. He’ s 4yrs. old, 72lbs. of black lab/border collie. HE loves the snow so much and the cold, he’ll stay outside in it for hours. You always have the most beautiful porch, Taryn and your winter one is no exception! I love the winter white and those burlap trees are darling! Looks cute Taryn! It makes me want to get mine decorated too! Loving the topiaries, can’t wait for the tutorial! :) Very wintery! 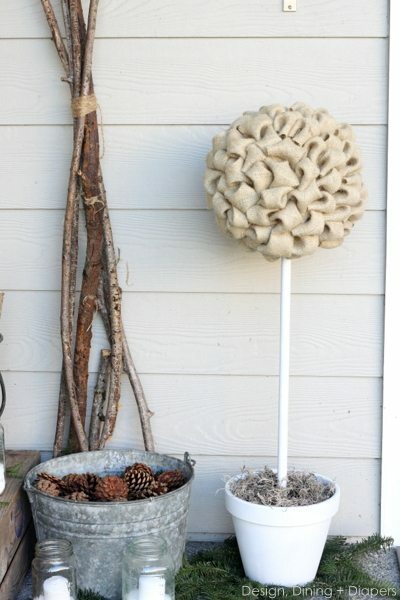 I love those burlap topiaries… so excited for the tutorial! 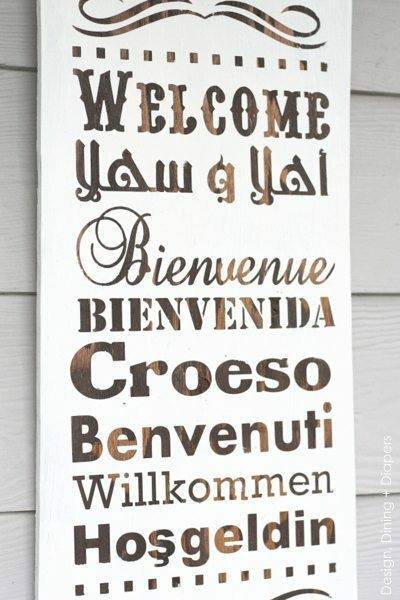 The Welcome sign looks awesome there. 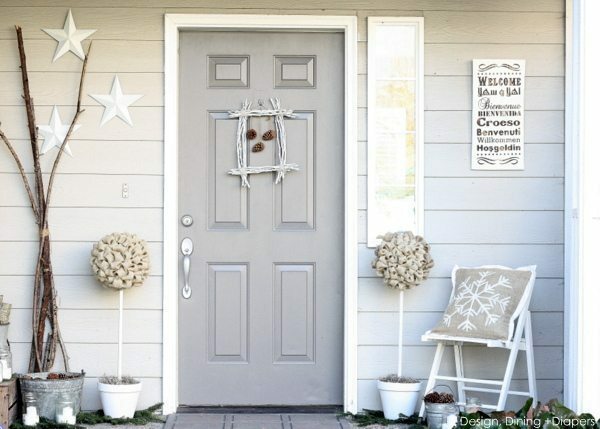 You’re inspiring me to try to dress up my porch a little. So, so cute! I love winter decorating! Valentine’s Day kind of takes over after Christmas, but I love to spend January in winter mode. Thanks so much for sharing! 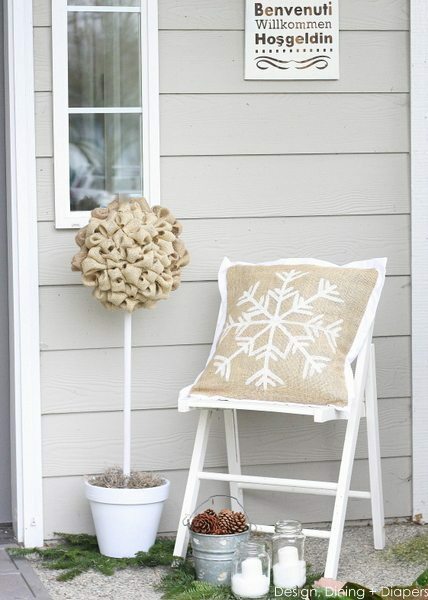 I LOVE the snowflake pillow! Have a great day! Those topiaries are adorable, I want one! Looking forward to the tutorial :) The whole porch is gorgeous and I would keep it forever. Lovely. I adore white! And I cannot wait to see how to make those topiarys – I think I need some of those! Just found your blog via a linkey on 36th ave – LOVE IT!!! Can’t wait to see the tute on those topiaries. SOO CUTE!! 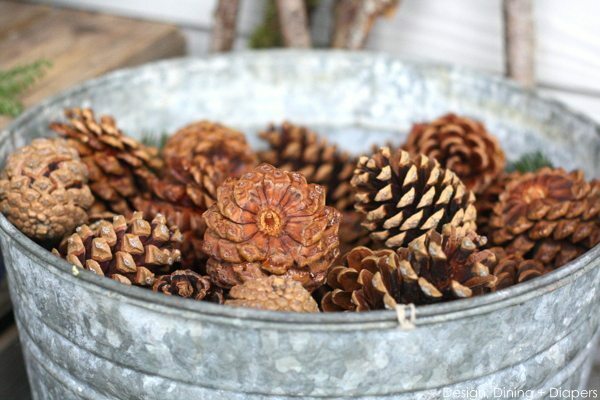 just some buckets and logs and pinecones, but it makes the perfect winter statement! This is truly picture perfect! This is beautiful! Thanks for hosting the party! This is a gorgeous porch! Great job! 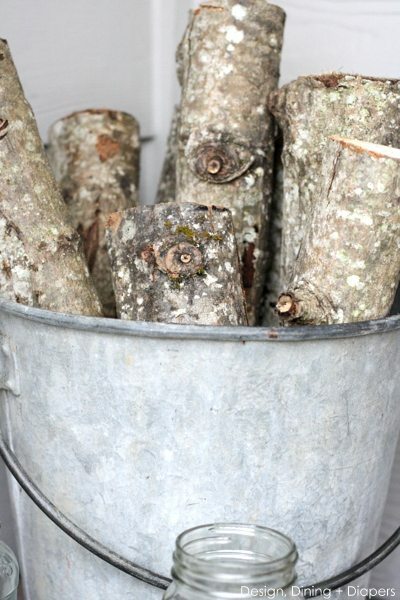 Your porch looks wonderful. I love all the different elements you incorporated. I am looking forward to the burlap topiary tutorial. I love this Taryn! It is beautiful!!! We’re featuring you this week @ Keep Calm & Link Up! Come by, grab a button, and link up your latest and greatest this weekend when you get a chance. Love it! I will have to give this a try.